The sportsbooks that make our recommended list have a solid track record and are considered the top sportsbooks for US players. The truth is there are tons of online sportsbooks out there but only a few that we recommend consistently to our US players. Sure you could bet at many different places online – but why would you risk it? Our #1 NHL sportsbook recommendation right now for Americans is BetOnline followed closely by Bovada. US players can’t really go wrong with either sportsbook so make sure to read our review of each to find out which is the best fit for you. Ideally though, it’s best to have an account at each of our recommended sportsbooks so you have access to the best odds as well as various promotions the sportsbooks offer. Getting the best odds means you’ll get more money back on each winning bet. Why bet $10 to win $9 when you could bet $10 to win $9.50? And sportsbook bonuses – sign up and reload – help to build your bankroll quickly, especially when you’re just starting out. Our rankings change occasionally so be sure to check back often. 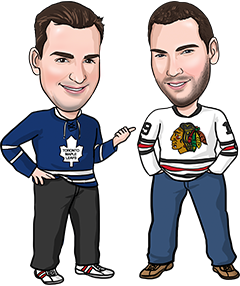 Better yet, join our email list as we sometimes send out important notes about the top US sportsbooks for NHL betting. Canadians should check out the best NHL sportsbooks for Canada and everyone else should go here for our rankings.